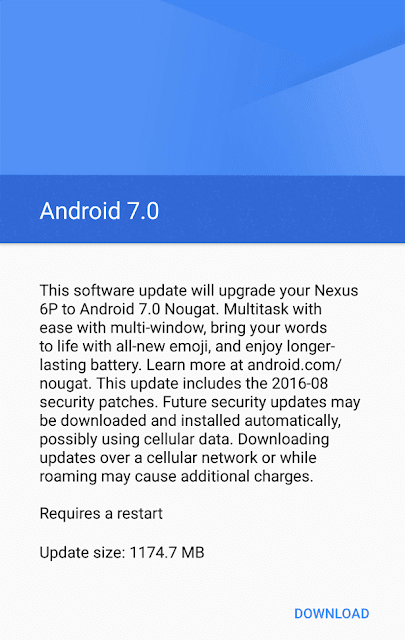 Google recently released the latest version of the popular Android operating system which is Android 7.0 Nougat. The operating system will be pushed to Nexus devices soon but you will have to wait for your turn to get the update notification. If you are impatient like me then you can simply enroll in the Android Beta Program to get the push notification to download and install Android 7.0 Nougat. I enrolled using the same Google account that I have added to my Nexus 6P phone and got the instant notification to download. Open the Android Beta Program web page. Log in using the same Google (Gmail) account that you have added to your phone. Scroll down and under Your eligible devices you will find your Nexus device. Agree to the terms and conditions and you will get a confirmation that your device is enrolled. You will see a notification (usually instant) on your phone to download the latest Android. If you don’t get the notification to get Nougat, then go to Android settings and navigate to About > System updates to go ahead with any other pending updates. Then you ought to see the download. The download file for my Nexus 6P was 1174.7 MB. Tap on Download and it will say Android 7.0 downloading. After the download completes, it is verified. You have to tap on Restart and Install and your phone will process the update package. Then it will reboot and install the system update in your device. That's it. No flashing manually. You get the stable release and not a developer preview. Don't forget to Unenroll Device from the beta release program after installation completes. Enjoy the latest Android version along with all the goodies that come with it like multi-window support, quick switch, in-built VR support, automatic notification bundling, data saver etc. which I will talk about in detail in soon to come future posts.